Together with his deacons Socius and Festus, and his lector Desiderius, Januarius, bishop of Beneventum, was subjected to most atrocious torturing during the Diocletian persecution (about 304). Nevertheless, with God's aid they were preserved unmaimed. The wild animals let loose upon them would not attack. Beheaded at Puteoli, their bodies were reverently interred in the neighboring cities. Eventually the remains of St. Januarius became the prized possession of the city of Naples. "Even to the present time the blood of the saint that is preserved in a glass vial will become fluid shortly after it is brought close to the head of the saint; then it bubbles up in a remarkable manner, as if it had just been shed" (Breviary). Cardinal Schuster makes this statement in his Liber Sacramentorum (vol. 8, p. 233): "The author has seen the marvel of the blood liquefaction at closest range and can give witness to the fact. Taking into consideration all the scientific investigations that have been made, he would say that a natural explanation of the phenomena does not seem possible." Patron: patron of Naples, Italy; blood banks; volcanic eruptions. Symbols: heated oven; two red vials on Bible; bishop's mitre (headdress); palm frond (symbol of martrydom); crown (of martyrdom). Find out more about this "miracle of Januarius", including pictures. If you live close to New York city you can participate in The Feast of San Gennaro celebrated in lower Manhattan. 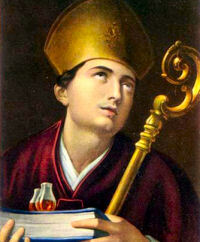 Read more about St. Januarius at EWTN. On September 19, 1846, the Blessed Virgin Mary appeared to Maximin Giraud and Melanie Calvat on the mountain of La Salette, France. After thorough investigation the Catholic Church gave approval to the message and secret of La Salette as written by Melanie. The account was published in Lecce on November 15, 1879 with the imprimatur of Bishop Zola of Lecce. Mary's message was much the same as at Fatima, "If my people do not wish to submit themselves, I am forced to let go of the hand of my Son. It is so heavy and weighs me down so much I can no longer keep hold of it." She lamented with tears those who do not keep Sunday holy and who take the name of the Lord in vain. She indicated that if men did not stop offending Our Lord the potato crop would fail. She gave Maximin his secret which he never revealed. She then turned to Melanie and gave her a secret which Melanie revealed 30 years later only to the Holy Father, who gave orders that it was never to be revealed.